Charles Gounod added a beautiful melody to Bach's Prelude in C to create this touching Ave Maria. Level: For advanced-intermediate (and above) pedal harpists. 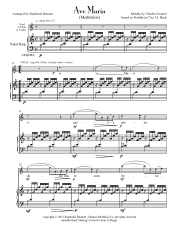 (Easy for violin/flute/oboe). Vocal range is a large range: G below middle C, to E top space of the treble staff. "Vocal" part may be played by violin, flute or oboe. Includes: 4 page harp part / score plus a page for vocalist and a page for instrumental soloist.